"The Light is your greatest weapon, Guardian." Ikora Rey is a human and the Vanguard for the Warlock class. Rey's extensive knowledge of her field has earned her respect "among all Orders." Ikora Rey sells Warlock armor and emblems, but will also sometimes assist in some exotic weapon bounties such as A Dubious Task. Following the Red War, Ikora began allowing Guardians to use her meditation device to relive past missions. She started her career as an iconoclastic Guardian, with a reputation for being outspoken and impatient with the dogma of her peers. She had a very colorful life on the battlefield, whether fighting in the Crucible or doing solo missions and getting shot down repeatedly, surviving against all odds. Her experience gave her a wealth of knowledge and newfound respect among her fellow Warlocks. Even so, she apparently has a reputation for being scary, including a rumor that she can turn people into frogs. Eventually, Ikora became a student of the Warlock Vanguard Osiris, arguably his greatest one. However, after her mentor's arrogance and obsession with the Vex grew out of control, she was forced to secretly take over many of his duties as Vanguard. Eventually, his focus on the Vex caused the Last City's other leaders to convene a meeting of the Consensus without Osiris present. The Speaker asked Ikora to take over officially as Warlock Vanguard, which she accepted. The Speaker then announced that he was exiling Osiris for his failure to serve the Last City and putting Guardians lives at risk chasing after Vex secrets. With no objections, Osiris was officially exiled and his post as Vanguard Commander was taken over by Zavala. Ikora then went to confront her old mentor in the Underwatch of the Tower and inform him of the Consensus' decision. She demanded that they needed to talk, but Osiris did not turn around and simply commented that he was surprised that she came alone and asked if she had learned confidence. Angered by his arrogance, Ikora claimed that she had, but not from him. Osiris claimed he knew why she was there, proclaiming that their confrontation and his banishment had been prophesied. Ikora noted that he had plenty of warning then, causing Osiris' Ghost, Sagira, to lash out at Ikora, proclaiming that she and the rest of the Last City stood no chance against the Darkness without Osiris. He claimed that Ikora knew that was true but would not admit it, but Ikora denied this and stated that winning under his terms was no victory. She then bid her former mentor farwell and turned to leave, but was stopped by Sagira, who demanded to know if Ikora was really just going to let the Vanguard exile Osiris after all he had done for her and teaching her everything she knew. Ikora angrily retorted that he had only taught her all he knew, causing Sagira to claim she would still be wasting time in the Crucible with Shaxx without Osiris. Ikora warned her not to insult the Crucible, as it had once been her home in the Last City. Sagira claimed that Ikora had wasted her talent there and that she owed Osiris loyalty on his quest against the Vex for making her more than a champion, causing Ikora to end the conversation and walk away. As Osiris prepared to leave the Last City for Mercury, Ikora met her former mentor one last time in the Tower's hanger as he readied the Sails of Osiris for launch. She suggested that he allow Shipmaster Cesar Hiponia to inspect the ship before Osiris left, causing the older Warlock to smile and note that she was always thinking ahead, which made her a fine leader. Ikora told him that was why she had to stay and lead as he once did, but he argued that the Infinite Forest on Mercury could be the key to simulating a path to their victory and understanding the Darkness. Ikora interrupted him, noting that while she wished him well in his quest, she feared his obsession would be his undoing, and that she would choose to stay and fight for what was real. Ikora welcomed a newly risen Warlock from the Cosmodrome in Old Russia to the Tower and provided them with basic supplies and Glimmer. She also directed them to speak with Banshee-44 to get an upgrade for their weapon. This new Warlock eventually discovered evidence in the Cosmodrome that the Warmind Rasputin was still alive and active in Old Russia. Ikora was elated by this discovery and declared that nothing in the Cosmodrome mattered more than the Warmind. Ikora met with the new Guardian again and asked them to investigate the Warmind network's communication arrays in the Cosmodrome. She warned them that Dead Orbit had sent scouts there to investigate but that they had never returned, and she wished to know their fate as well as what Rasputin might be planning. The Guardian succeeded in reactivating the arrays, but the three Dead Orbit Guardians were found dead and Rasputin took control of the array and locked the Vanguard out. Ikora was fascinated that the Guardian had made contact with the Warmind, and directed them to report back to Zavala, who had another mission for them. After the Guardian raided The World's Grave in the Hive's tunnels beneath the Moon, Ikora was pleased to finally have a chance to learn the greatest secrets and goals of the Hive. She worked alongside the Cryptarchy to decode the stolen information. The Guardian soon disrupted a Hive ritual that was using a fragment of the Traveler to drain its Light, which restored the fragment and helped restore some Light to the sleeping entity. Ikora was deeply interested in the implications of the ritual, noting that they seemingly confirmed the controversial Warlock Ulan-Tan's theory that all Light was connected, but she also worried that the servants of the Darkness could use that connection against them. Ikora later sensed a Hive abomination being raised within the Hellmouth, and ordered the Guardian to take a strike team down into the Hive's Summoning Pits and destroy it. The strike team succeeded in destroying the Ogre Phogoth, the Untamed, and while Ikora was pleased by its end, she wondered how many more abominations the Hive were creating throughout the universe. Ikora also met with her friend and Hidden agent Eris Morn, who feared that the Hive's recent activity was indicating they would soon make another attempt to claim the Earth. She learned from Eris that the Hive God Prince Crota's top general Omnigul was present and active on Earth. Questioning why the Wizard was there, Ikora asked her friend to speak plainly and not in riddles, and Eris stated that she believed they sought Rasputin in the ruins of the Cosmodrome. Worried, Ikora noted that although Rasputin had yet to ally with the Vanguard and did not even talk with them, she believed he seemed just and on humanity's side. They discussed the Hive's goals, and concluded that they did not seek to destroy Rasputin, but rather corrupt him and bring him onto their side, which they feared would be the end of everything in the system. Ikora swore to make the Vanguard and the Speaker listen despite their distrust of Eris, but the Hunter believed it too late for that. Ikora decided that she needed help then from another Guardian, and convinced a weary Eris that her own battles in the field were done with the loss of her Ghost and that she must allow another brave soul to fight the Hive in her stead. She also promised Eris that she would ensure that she was welcome in the Tower despite the other leaders concerns. "We must assume the abomination was part of something greater. And we cannot flinch from the terrible, obvious comparison: just as the Traveler acts through us, this power was able to act through its own servants." Ikora ordered the Guardian to carry out another strike on Venus in the Vex tunnels beneath the Ishtar Academy. She briefed the team on their target, a Vex Axis Mind known as Sekrion, Nexus Mind, which was a world-eating machine that was charged with the transformation of Venus into a Vex world. Once the Nexus Mind was destroyed, Ikora noted that this did not halt the conversion of Venus, as the Vex still had other minds throughout the world that the Guardians could not reach, and that they must continue to pursue their enemy into the depths of the world. The Guardian later came to Ikora for aiding in finding a way to wake the Eye of a Vex Gate Lord in order to gain access to the Black Garden and destroy the Darkness at its heart. She informed them that her Hidden agents had found a way to attune the eye to the gate of the Black Garden by using a Vex Spire on Mars. However, the only one that Ikora knew of that was above ground was also in the middle of a Cabal war camp. The Guardian soon returned with the wakened Eye, and Ikora complimented their Ghost on a job well done. However, she cautioned the Guardian that while they could now open the gate to the Black Garden, they must ensure their will was ready for such a task. The Guardian's will proved true and they destroyed the Black Heart at the center of the Garden, bringing it back into reality on Mars. Following this victory, Ikora gathered with Zavala, Cayde, and dozens of other Guardians in the Tower plaza to hear the Speaker's address on this great victory. Despite this victory, Ikora was ordered by Zavala to go over the reports of the Guardian's mission into the Black Garden and give him an assessment of possible remaining threats. Amused by her friend's constant worry, Ikora nevertheless compiled her report. In it, she theorized that the Vex had discovered the Black Heart and its power but were unable to understand it, and thus turned to worship as a way of receiving empowerment. Ikora also believed that the Sol Progeny had been constructed solely to be vessels of power and will for the abomination, and that if it had been left unattended it could have unleashed horrors upon the galaxy. She also noted that there was great hope in the fact that the Black Heart could only activate one of the Sol Progeny at a time, and that it was threatened by the Light of a single Guardian. Lastly, Ikora concluded that the Black Heart was but a piece of the Darkness and that it acted through the Sol Progeny much as the Traveler did through its Guardians. She speculated that there could be more pieces of the Darkness out there acting through similar vessels. Although the Black Garden was now settled into reality on Mars, Ikora worried that the Vex would attempt to pull it out of time once more. She met with Zavala and Cayde, and stated that she believed that The Undying Mind was attempting to undo the destruction of the Black Heart. Ikora was determined that the keep the Garden in reality where the Light could touch it so that they could continue mapping its pathways with the data files recovered from the Ishtar Collective. The others agreed, and Zavala authorized a strike to eliminate the Vex mind. Ikora ordered the Guardian to lead the strike and prevent the Black Garden from being resealed. The team destroyed the Undying Mind deep within the pathways of the Black Garden, and Ikora thanked them for ensuring its continued presence in reality. However, she worried that the Vex would never cease their efforts to take back the Black Garden and was determined to hold it in reality until the Vanguard had learned all of its secrets. Ikora was apprised of a group calling themselves the Shadows of Yor who were using copies of Thorn, the infamous weapon of the murderous Guardian known as Dredgen Yor. Concerned about their ruthless behavior in the Crucible after the results of a match on Blind Watch, Ikora approached Lord Shaxx and informed him of her worries that the Shadows could be following too closely in Yor's footsteps and that they should be watched. Shaxx agreed, but believed that Orsa Zyre, one of the leaders of the Shadows, had managed to contain the Darkness where Yor had failed. Ikora believed that a dangerous assumption and noted that the Thorn's presence in the Crucible was becoming ever more widespread. Ikora later met with Shin Malphur, Dredgen Yor's killer, after he saw footage of the Shadows of Yor in a match at Widow's Court. He was worried Ikora and the Vanguard were not taking the threat the Shadows represented seriously enough, and she attempted to reassure him that she shared his concerns and was monitoring the situation, but that given his past with Yor and all that he had lost to the killer and his Thorn, he might not be unbiased in how he viewed the Shadows' actions. Shin refuted that assertion and told Ikora that the Shadows were playing with death. During the events of The Dawning, Ikora Rey tasked the Guardians in eliminating old foes that have returned, Taniks Perfected, Sekrion, Nexus Mind and Omnigul. During so, Cayde-6 "assists" though Ikora knew he was only helping because he was both bored and attempting to get out of coordinating a team of Hunters that didn't like him. Regardless, both aided the Guardians in eliminating their old foes. "Red Legion, you will take no more from us. And you will find no mercy in me!" On the anniversary of the Battle of Six Fronts, the Last City and its Guardians were preparing to celebrate the unity of the City and foundation of the Vanguard. Instead of preparing for the celebrations, Ikora met with Zavala and Cayde in the Hall of Guardians and reported to them that all of the Skyline Defense Systems had been sabotaged, while Cayde noted that their comms network had been spotty for several hours. While attempting to get more information from the Last City's orbital satellites, Ikora realized that they were no longer there, and Zavala ordered everyone to battle stations as Cabal warships suddenly emerged from the storm clouds around the Last City. As the Tower came under heavy missile bombardment, Ikora grabbed Cayde and teleported him to safety inside Zavala's Ward of Dawn just before he was crushed by falling debris. Surviving the bombardment, Ikora, Zavala, and Cayde spread out through the Tower to defend it from assault. The Young Wolf soon joined the battle, and Ikora informed the defending Guardians that the Cabal they were facing were the Red Legion, which according to her sources had never known defeat. Zavala ordered all Guardians to rally in the plaza, but Ikora protested that the Red Legion were assaulting the Traveler with a unknown device. She was told by the Commander that they had to defend the City and its people first. Ikora and the others defended the plaza until the last evacuation shuttles extracted the civilians from the Tower, but the Speaker never arrived to be evacuated. Ikora went to his tower to find him, but discovered the Red Legion had gotten there first and captured him before destroying his quarters. Enraged, Ikora killed several legionaries with a Nova Bomb as the Young Wolf arrived to assist her. Explaining the situation to her fellow Guardian, Ikora turned her attention to an approaching Harvester. Utilizing her Light, Ikora leaped upon the Cabal ship and crippled it with another Nova Bomb, declaring that the Red Legion would take no more from the Last City as she rode the failing ship down to the battle below. Utilizing her Void abilities, Ikora Blinked to a Interceptor and threw three Vortex grenades into its vents before Blinking to another Harvester and shooting its antigravity cores with her shotgun, Invective. She then blinked to another Interceptor and looked back at the Traveler, which had become encased in the Cabal's cage. Infuriated at the Red Legion's blasphemy and their assault on her friends, Ikora unleashed a Nova Bomb onto the ship she was riding. As she leapt off to Blink to another Cabal vessel, she was severed from the Light and began plummeting towards the ground. As Ikora struggled to understand what had happened, she quickly emptied her clip into the supports of a billboard below her, causing it to collapse towards a nearby roof. She slammed into the hard metal and rolled to safety on the roof, although her shoulder was separated by the hard landing. Even with her injuries, Ikora's rage led her to stand up and go hunting for her next target. Ikora managed to escape from the occupied Last City, but did not join Zavala in his retreat to Titan. Her first act was to send a message to all of her Hidden agents, instructing them to go into hiding at their safehouses and wait for the Red Legion to become complacent before conducting operations against them, as they could not afford to risk their lives now on foolhardy missions without Light to resurrect themselves. She included two direct messages for specific agents into her missive, with the first telling Chalco Yong that she had been right about the Guardians losing sight of keeping an eye out for unknown threats and reassured her it would not happen again. Her second message was to Eris, hoping that she was still alive on her quest for information about the Hive and reassuring her that their would be a home for her to return to when she came back. She ended the message with another general order to all of the Hidden to wait for her word, and that they all knew what to do should it never come. Desperate for answers and seeking to regain her Light, Ikora travelled to the Shard of the Traveler in the European Dead Zone in an attempt to regain her lost powers. Fighting through elements of the House of Dusk that inhabited the Blackened Forest, she carefully and methodically eliminated all the Fallen guarding the Shard. Once they were dead, Ikora approached the Shard and touched it, but it remained inert and did not restore her connection to the Light. Confused and angry, Ikora eventually calmed down and resolved to find answers elsewhere, and decided to travel to Io, a moon of Jupiter and the last place the Traveler had touched before the Collapse. Stealing a Red Legion ship, Ikora flew to Io and landed on the Echo Mesa, near the Cradle where the Traveler had settled to terraform the moon. Stepping onto the surface of Io for the first time without Light felt wrong to Ikora, but her sense of unease turned to anger as she watched three Red Legion Harvesters fly overhead. Infuriated that the Red Legion were not desecrating another sacred location. Taking quick stock of her supplies, Ikora resolved to avoid the Vex presence on the moon and head for the Red Legion stronghold Terrabase Charon and make them pay for their transgressions, even if it cost Ikora her final life. Her campaign against the Cabal consumed her, and Ikora lost track of how long she stalked and murdered their patrols. During one battle against the Red Legion, she lost Invective after emptying its last ammo into a Interceptor and bludgeoning a Psion to death with its stock. Abandoning her broken weapon by a guard tower, Ikora treated her numerous wounds and removed shrapnel she had taken in one of the battles. Near death, Ikora realized none of her actions had halted the Cabal's actions on Io and regretted her ill-advised assaults. Passing out, Ikora awoke to find herself staring at the Cradle. Walking to the cliffs edge, Ikora resolved to wait for someone else to arrive before taking further action. Once the Guardian arrives and Ikora learns of what has transpired in her absence, she returns to Earth to help her fireteam plan to retake the City. 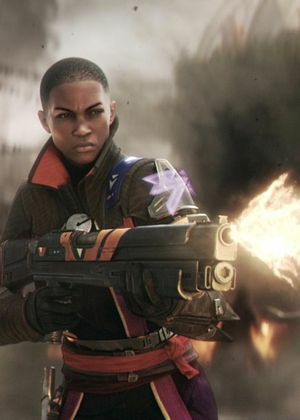 During the attack, Ikora leads a unit using sparrows to confound troops and create an opening for the other teams to enter the City. Once the attack begins, she regroups with Cayde and Zavala to teleport to Dominus Ghaul's location. Unfortunately, the Vanguard was too badly wounded to go themselves, and the Guardian is sent in their place. Once Ghaul is defeated and the Traveler reawakens, Ikora returns to work leading the guardians and watching over the recovering City. "This could have been the beginning of a major war, and you stopped it dead in its tracks. If the Taken and Vex continue to conspire together, I will be the first to know, and you two will be the next." Although the Vanguard was victorious against the Red Legion, threats to humanity remained throughout the system. Ikora was contacted by one of her Hidden agents on Io who claimed to have seen the Taken interacting with Vex, but the agent then went silent. She requested that the Young Wolf investigate the matter, believing it could be connected to the Ascendant portal they had managed to prevent from opening. They discovered that the Taken were capturing Vex, causing Ikora to ponder if they were attempting to Take them, but Asher believed that would be impossible without a King to guide the Taken. She rebuked her fellow Warlock's certainty, noting that the impossible often happened. The Young Wolf continued their investigation and discovered Ir Arok, Tongue of Quria was leading the Taken on Io but retreated when confronted. Ikora was surprised that the Knight had the sense to retreat, and worried that others besides Oryx could have the power to Take. Tracking Ir Arok to the Cabal Warbase ruins at Excavation Site II, Ikora warned the Young Wolf that her Hidden had yet to penetrate the facility and scout it. Asher also retracted his previous statements on the Taken, noting he could feel them manipulating the Vex through his arm. Within the base, the Young Wolf reported finding holding cells for the Vex, and Ikora berated Asher for joking that the Taken had invented law and order while cautioning the Young Wolf to be careful and that she only had one of them. The cells transformed the captured Vex into Taken, vindicating Ikora's theory, but Asher believed it to be suicidal, as the Vex infected whatever they touched and could take over the Taken. Ikora believed that it was a calculated risk on the part of the Taken, and that they were attempting to build an army. She directed the Young Wolf to meet with Asher and formulate a plan to stop the Taken. The Taken had turned their attention to the Pyramidion, which Ir Arok intended to use to Take the entire Vex Collective. Ikora and Asher sent the Young Wolf to stop their plan, and she warned them that if Ir Arok succeeded, the Taken could unless devastation across the solar system. Asher pointed out that losing the Young Wolf would devastate the Last City so soon after the Red War. The Young Wolf succeeded in their task and killed Ir Arok, but reported that some Taken managed to make it through a warp gate into the Pyramidion. Ikora was pleased with the result, and noted that they may have prevented another major war with the Taken from beginning with this victory. She vowed to monitor the Taken and Vex's activity on Io to ensure that further attempts to consume the Vex collective were not made, and that she would inform the Young Wolf if one was. "When the Red Legion attacked, it almost cost us everything. It took a miracle to save us… the awakening of the Traveler. This is our new beginning. The maps are blank. The rules are gone. All we know is we must become more than what we were. This small corner of the cosmos is the only place that is forever ours. And the universe watches us with envious eyes. We've proven we can fight threats from beyond the stars. But now there are things stirring beneath our feet… provoked by the Traveler's Light. Our war… is just beginning." As the City began to rebuild under the awakened Traveler, Ikora met with the other members of the Consensus to discuss the governing of the City. When Executor Hideo objected that they could not be called to order without a Speaker, Ikora prevented Cayde-6 from escaping the meeting and declared that they had to meet despite what the bylaws said. Lakshmi-2 asked if there was a protocol for choosing a new Speaker, and after Zavala revealed that there was not one, Ikora advocated amending the bylaws to create such a process. Zavala declared that until they had a new Speaker, they would all govern together and forge their own consensus without a Speaker's aid. At a subsequent meeting of the Consensus, Ikora was agitated that Zavala and Hideo brought the Hunter Ariadne Gris before them to investigate whether the dragon she had painted on her Sparrow indicated that she worshiped or had come into contact with Ahamkara. When Zavala asked for her opinion on the matter, Ikora admitted that she had stopped paying attention and could not believe the meeting was still going, causing Arach Jalaal to laugh. Ikora concluded that Ariadne's poor win/loss record in the Sparrow Racing League was proof enough that the Hunter did not have contact with a wish dragon, leading to the Consensus' official declaration that the dragon symbol was merely "cool". The awakening of the Traveler caused Ikora to reexamine all of her old research, particularly her twelve volume series "On Circles". Foregoing field work, Ikora spent long periods studying in her hidden private library. One day, Chalco Yong, a member of Ikora's Hidden, snuck into the library to see what Ikora was doing. Without stopping her research, Ikora acknowledged her friend and noted that she had to completely rewrite all twelve books in the series due to the Traveler awakening and changing their understanding of physics. Chalco was skeptical that the Traveler would so radically change their understanding of circles, causing Ikora to finally look at her and state that especially their conception of circles had changed. When rumors of strange activity on Mercury started to surface from the Cult of Osiris, Ikora ignored it, dismissing them as mere conspiracy theories. However, one of her Hidden then brought her Sagira, who was found badly damaged and deactivated at the same time Vex activity surged dramatically. Ikora summoned the Young Wolf and asked them to investigate these developments in secret from the rest of the Vanguard due to the potential involvement of her former mentor Osiris. As the Young Wolf traveled to Mercury, Ikora explained to them that the Vex had replaced the core of the planet with a machine known as the Infinite Forest, which could calculate infinite realities. She was displeased when Brother Vance made contact with them, dismissing him as Osiris' "greatest fan". Vance claimed that his faith in Osiris had led them to him, causing Ikora to mock him for having faith in a man who questioned everything. After the Young Wolf investigated the Vex activity around the entrance to the Infinite Forest, Vance suggested that they take Sagira to a Cult of Osiris outpost on Earth that could help heal her. With the new revelations about the nature of the Vex, Ikora began furthering her research of them. She was disappointed that the Young Wolf's presence at the beginning of the Infinite Forest did not reveal an understanding of the Vex. As she pondered the nature of the radiolarian fluid and dismissed it as being the Vex's consciousness, Ikora wondered if she had discounted Lakshmi-2 and the Future War Cult's device too quickly since the key to understanding the Vex might be exploring their ability to predict and simulate timelines. She turned to her Ghost, Ophiuchus, and asked their opinion, catching her companion off guard as they had not spoken in more than sixty-one years. Ikora noted that they were friends once, and that she was ready to hear Ophiuchus' opinion again. Ikora would suffer a personal loss after Cayde-6, her friend and fireteam comrade, was murdered by the formerly missing Awoken Prince, Uldren Sov and the Scorn, an army of morbid and grotesque Fallen under his command and that of seven Barons. Cayde and the Guardian arrived in the Reef to aid the Awoken in containing the chaos that engulfed the Prison of Elders but as the Scorn escaped their cells, Cayde found himself surrounded and beaten. Worse, his Ghost would be destroyed and his personal weapon, the Ace of Spades, stolen by Uldren. Within his final moments, the Hunter Vanguard is killed by Uldren who then departs to spread chaos throughout the Reef. The Guardian returned Cayde's body home and the Vanguard mourned his loss. Ikora was most enraged that Cayde was gone and desiring retribution against Uldren for his crimes, Ikora proposes that the Guardians take the Reef by storm to kill Uldren and his Scorn minions once and for all. However, Zavala objects as while he too mourns the loss of his friend and desired justice, the Titan Vanguard stated that the Last City must remain the Guardians priority and they simply do not have the resources or the time to go on a manhunt, not while thousands of other escaped inmates from the Reef Prison flee across the system. Ikora vehemently opposed this, even calling it an act of cowardice but before she could argue any further, the Guardian speaks, to her surprise, vowing to hunt Uldren Sov. Ultimately, the Guardian would succeed in hunting down Uldren, avenging Cayde, and dismantle the Scorn's operations within the Reef. After returning to the Last City, Ikora expressed her gratitude in the Guardian's efforts to avenge the Hunter Vanguard. Afterwards, she ruminates that regarding all of her relationships, Cayde may have been her healthiest relationship, her ridiculous friend. Thus, she remembers that they are not only fighting for their home but also fighting for their friends. "Our feelings don't matter right now. We need to be people they want to follow, not people they mistrust and want to fight." The months following Cayde's death and the subsequent events in the Reef left the Vanguard uncertain about their future direction. Ikora believed that her and Zavala's grief over the loss of Cayde, combined with their additional duties helping govern the Last City since the Speaker's demise, had impacted their ability to lead and shaken confidence in them amongst the Guardians. She and Zavala felt that their primary duty as warriors was not being met by their position and both considered potentially stepping down from their respective positions to let new leadership arise, or even disband the Vanguard entirely. Ikora informed her Hidden of these discussions, but noted that such drastic action would not be taken without consulting them, the Consensus, and the rest of the Guardians, but also instructed them to take whatever action they felt necessary if they believed the Vanguard had begun to do more harm than good. In the meantime she and Zavala sought to find a Hunter to assume Cayde's place in the Vanguard, as the terms of his Dare granting the position to whomever was responsible for his death led them to disregard it lest they be forced to offer the position to Savathûn, the Witch-Queen, who had been responsible for manipulating Uldren and the Scorn. Instead, they wished to gather the most capable Hunters together and find a worthy candidate amongst them, although all the Hunters who would be qualified had fled the Tower to avoid being considered for the dreaded position. When Aunor Mahal leaked a dozen Hidden reports through the rewards Zavala handed out to Guardians for strike duty, Ikora managed to redact a few before they were read. She later joined Zavala in the Tower's Bazaar as a rainstorm engulfed the City and most citizens sought shelter. As they sat on a building ledge and stared out at the Last City, Ikora informed Zavala of Aunor's actions, and he remarked that Aunor and Ikora were quite similar. Ikora agreed, and when he asked what she wanted him to do about it, Ikora stated Aunor was her agent and she would deal with it, but that Aunor was also quite capable and that they owed her and the rest of the Guardians more than they had been giving them recently. Zavala agreed, but stated the reverse was true as well, causing Ikora to chuckle and note that was correct. However, Ikora believed that they were not providing them with examples that they wanted to follow and that too many Guardians mistrusted them at the moment. Her friend hoped that mistrust would soon pass, but resolved to be better all the same as they stared at the inert Traveler. After a moment of silence, Ikora quietly stated that she wished Cayde was there with them, and Zavala placed a comforting hand on her knee as he sadly echoed that sentiment. "Ikora looks at me with one of those looks that—you know sometimes you talk to Ikora and you just think, wow, you are not even using a fraction of your brain on me, are you? One of those looks." Before becoming Osiris' disciple, Ikora was one of the fiercest competitors in the Crucible. Lord Shaxx believed that Ikora's true home was the Crucible, though she would never admit it. As a young student to Osiris, she was very close to her teacher and is considered his greatest student. They conducted many experiments together and Osiris taught Ikora what it meant to be a Warlock. However, Osiris' growing obsession with the Vex and his disillusionment with the Speaker and the Traveler began to divide them. While her teacher neglected his Vanguard duties in favor of his research, Ikora showed initiative in leading the Warlocks in his place and did her best to defend her teacher when others began to call Osiris a heretic for his views. Ultimately, however, seeing his arrogance and dangerous obsessions with the Vex, she felt that if Osiris continued to operate in the City he would ultimately tear it apart. Even after countless years apart, Ikora called Osiris the most notorious Guardian who ever lived. Despite this, she was nonetheless pleased to see her mentor again and changed for the better after the conflict with the Vex on Mercury. As the Warlock Vanguard, Ikora serves as a balancing force between the steadfast yet rigid Zavala and the unorthodox yet reckless Cayde-6, offering the most logical course of action and whatever wisdom she has to spare. It is her duty to gather intelligence on the City's enemies and defeat them before they become a threat. As such, she formed the Hidden, a network of agents that spy on enemy forces. Her leadership, resolve, and bold initiatives makes her well-respected in the Vanguard, amongst her fellow Warlocks, and with the City factions. The only time she questioned herself was during the Red War after losing the Light, but thanks to the Guardian's efforts, she regained her sense of spirit. Ikora has proven to be accepting of more questionable sources than she is willing to admit, but does so cautiously. She was the only member of the Vangaurd who took Eris Morn seriously, listened to her warnings and treated her like a friend. In addition, while she tended to ignore them, she did listen to some of the messages of the Cult of Osiris when they actually lead to something, but she nonetheless has a low opinion of them. In fact, the only person she is ever irritated and exasperated with is the Gensym Scribe, Asher Mir, but even she couldn't deny his expertise on the Vex. Despite her calm and focused nature, Ikora does have a sense of humor, more so than Zavala but less than Cayde. While Cayde is wise-cracking and rarely serious, Ikora tends to be witty and sarcastic when dealing with the Hunter Vanguard. Ikora does possess her own dark side, particularly a vengeful one. When Cayde-6, her teammate and friend, was murdered by Uldren Sov, Ikora simply refused to do nothing to avenge him, calling it cowardice. While Zavala also mourned his friend, he felt duty-bound to defend the Last City and thus refused to go out on a manhunt for the renegade Reef Prince, angering Ikora. However, when the Guardian who witnessed the murder vowed to take the head of Uldren, Ikora supported them and approved the mission to take the Reef by storm, kill Uldren, and his Scorned barons. Ikora serves as the head of Vanguard Research. Upon completion of the Red War campaign as well as the Curse of Osiris and Warmind campaigns during year 1, players were able to perform three Meditations per week which acted as replays of the story missions (though, as of year 2, this has been retired in favor of a Daily Heroic Story playlist). Finishing each meditation granted three Vanguard Research Tokens (which could also be earned on days that she incited Guardians to complete five Challenges on) to be returned earning faction gear: specifically, legendary versions of the armor worn by players during the Homecoming story mission. "Prepare the feed. Mars, near Freehold." "Do you hear that? The voices? Sounds like, chanting." "Hmm, do you sense it too?" "Osiris knew things he couldn't back. Must've driven him mad." "Tell me this: What is Oryx?" "Do I scare you Guardian?" "I assure you, the things they say about me aren't... all true." "I can make you speak, if I wanted to." "If this is some kind of game, I don't have time." "I'm nothing to be frightened of, Guardian." "I've got good feeling about you, Guardian." "Hmm, it's merely bent. It's yet to break." "Oh, come on! I don't turn people into frogs, or whatever you heard." "Oh, that's tempting... that's so tempting." "Something pushing back, a consciousness. Not human." "Speak, Guardian. I'm not that scary." "Speak, if you think you sense something. Don't be shy!" "The Dark is relentless, Guardian." "We can help you, Guardian." "We expect great things of you." "Tell Cayde, I'm not falling for it again." "It's like the time I had that stare-off with Brask.... Did I say that out loud?" Concept art of Ikora Rey. Ikora Rey is voiced by Gina Torres who also portrayed Zoe Washburne in the TV series Firefly. Ikora possess her own collection of books and tomes of rare quality. She has such a collection that there are few books that she doesn't own. As such, she was impressed and grateful with Eva Levante's Dawning gift of books. Ikora was the first Guardian to have a twenty-five match winning streak in the Crucible. Despite the Destiny 2 teaser trailer that showed Ikora being a Stormcaller, the gameplay reveal trailer showed Ikora Ray in action as a Voidwalker. However, Zavala and Cayde-6 were both known to use classes outside those they typically use as well(Striker and Bladedancer, respectively); since all Guardians are capable of swapping Subclasses at will, it's possible that this wasn't an error. In Destiny 2, her Warlock bond's holograph is moved from her shoulder-plate to the more traditional Warlock bond under it. Ikora's ghost is named after the summertime constellation, Ophiuchus, which represents a man holding a serpent. ↑ 1.0 1.1 Bungie (2014-9-9), Destiny, PlayStation 4, Activision Blizzard.